Imagine your pet getting lost without any kind of identification to help someone return it home. While collar id tags are useful for providing owner contact information, collars can be easily slipped or the id tags themselves can fall off or even become worn over, making it impossible to read the information on them. Perhaps the lost pet ends up in a shelter where it is adopted to a new home. Perhaps it is euthanized. It is hard to think about, but it does happen. That is where microchips have the advantage. 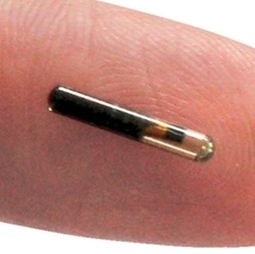 A microchip is a tiny device roughly the size of a grain of rice that is safely and permanently implanted under the loose skin of a cat or dog's neck. When a lost pet without an id tag is found, it can be taken to a local veterinarian where a scanner is used to detect the prescence of a microchip. If one is found, it will transmit its ID number. The chip manufacturer is then contacted, who in turn contacts the pet's owner. This increases the chances that you and your pet have a quick reunion. It is our recommendation that pet owners use both an id tag and a microchip to identify your pet. Please feel free to contact us to learn more about microchip identification.